The Atlantic Highlands Yacht Club (AHYC) Ms. Race, a race for women by women in the deep blue shadow of the New York City skyline, celebrates its tenth anniversary as a successful charity regatta. Founded in 2005 by a group of female sailors at AHYC in Atlantic Highlands, NJ, the AHYC Ms. Race takes place on Sandy Hook Bay, with proceeds donated directly to 180 Turning Lives Around, Inc., a private, non-profit organization dedicated to ending domestic violence and sexual assault in Monmouth County. Last year, 45 women on five boats raised their sails for 180 Turning Lives Around, and this year’s race promises to be much bigger. “My daughters and I are looking forward to being part of this great race and fundraiser again this year,” enthused Donna Syers, a two-time winner of the Ms. Race and mother of four girls who are also ardent sailboat racers. 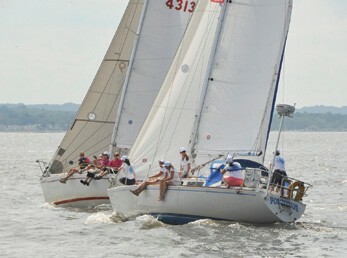 The 10th Annual AHYC Ms. Race is Saturday, August 16. Individuals and organizations that would like to participate should contact the Ms. Race Committee at ahyc.ms.race@gmail.com, or Diane Kropfl at dkropfl@att.com or 732-872-9190.